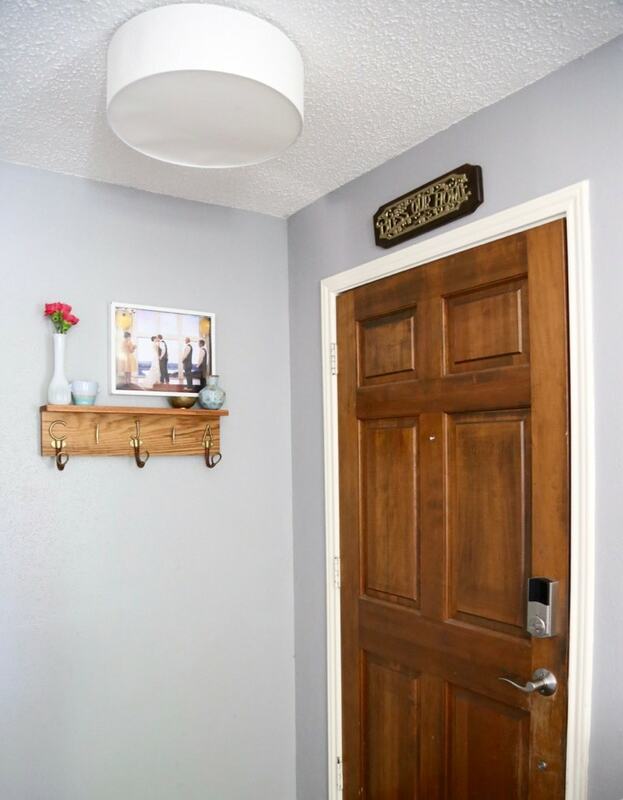 I’ve been wanting to give our entryway a little refresh for a while now – it’s always been a little blah, and back to school time is the perfect time to take it on. Once Corey and I head back to work things get really crazy really fast – on top of the normal chaos I’m starting a new position at work (and just found out a couple of weeks ago!) and Corey’s campus is going through some major changes too. So, needless to say, it’s going to be a particularly crazy start to the school year. I function way better both at work and at home when my house is in order, so it’s absolutely imperative for us to be organized and ready to tackle whatever this year has in store for us. Now that we’ve got a nice, organized entryway I think that’ll be a lot easier. We started off with a brand new coat rack. We’ve had a cheap-o old one hanging there ever since we moved in, but the hooks were too small (so everything was always falling off) and it wasn’t pretty at all (so I hated staring at it from the couch every day). I wanted something with nice, big hooks that could handle all of our junk, I wanted a shelf on top to hold things like sunglasses, and I wanted it to be easy on the eyes. This thing was easy to build and it turned out beautifully. 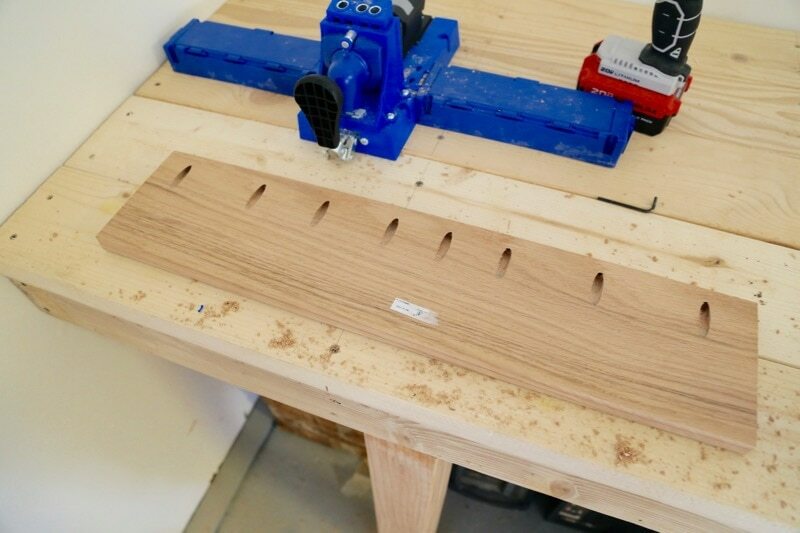 Corey built it with some small oak boards – he just cut the board for the shelf down to the depth we wanted (ours is about 5″ deep) and drilled pocket holes in the back – to attach them together. 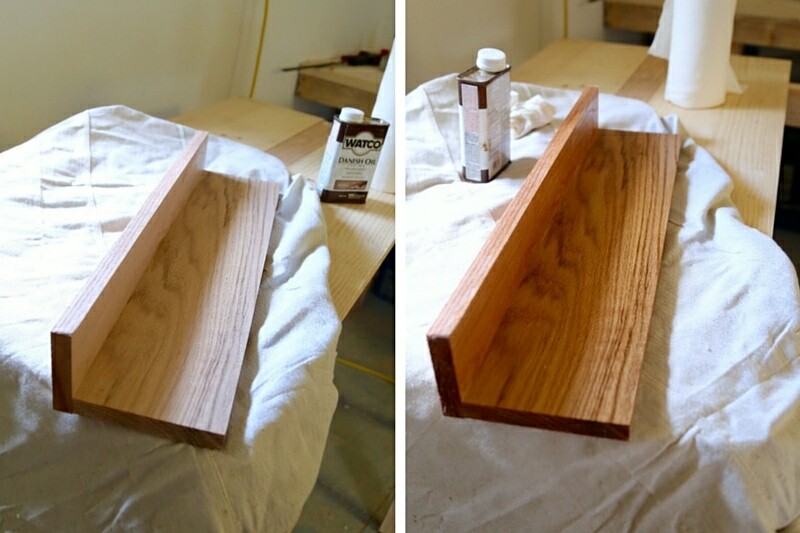 Then, I used some Danish oil to enhance the natural color – I love how rich the wood looks! I may be just a little obsessed with this stuff. Once everything was all dry, we added a few cute hooks that are big enough to handle our mess. 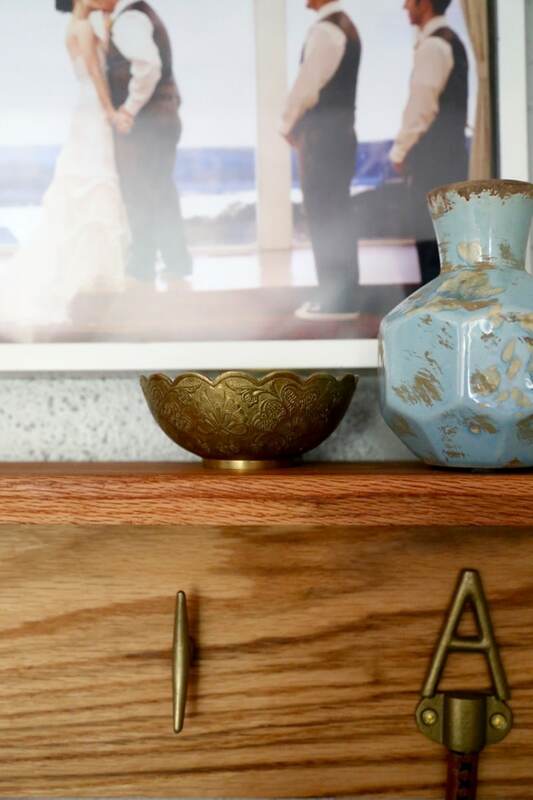 We knew we wanted a mismatched look and we were so excited when we found these letter hooks with each of our initials in the clearance bin. We added a few knobs (not technically meant for hanging things but they work like a charm!) and just like that, we had a totally customized coat rack. 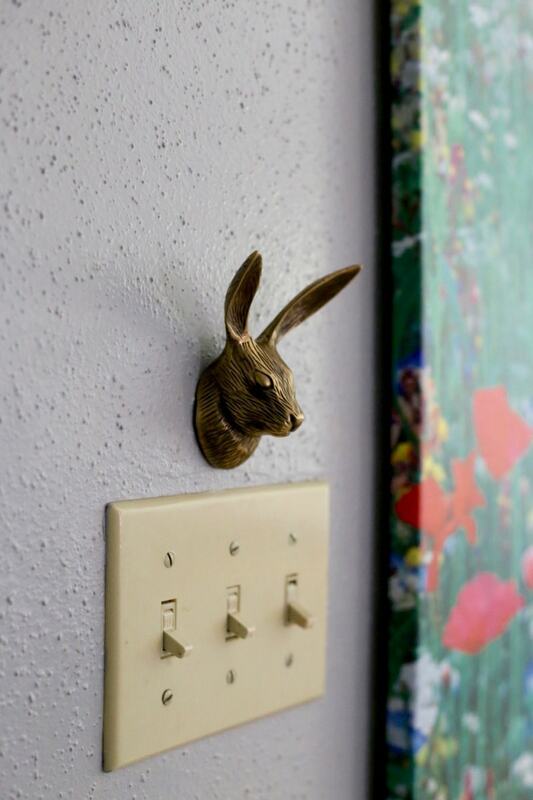 We also grabbed this cute little rabbit hook as an easy place for us to drop our keys when we walk in the door. It adds the perfect amount of whimsy and keeps us from just dropping the keys on the table where they inevitably get lost. Now that we have everything all pretty and organized, all that’s left is to keep it clean. We’re suckers for Mrs. Meyer’s Clean Day® cleaning products so we were psyched to head to Whole Foods Market and pick up a few of their products for this post. Why Whole Foods Market specifically? Because Mrs. Meyer’s Clean Day® will donate $1 to Whole Kids Foundation for each of the first 25,000 cleaning products that are purchased between August 24th and September 13th at Whole Foods Market. That money will then go towards helping kids learn to grow and enjoy eating fresh fruits and vegetables. I’m pretty sure I now have four different bottles of the Mrs. Meyer’s Clean Day® Multi-Surface Spray in every dang scent. I have a problem. 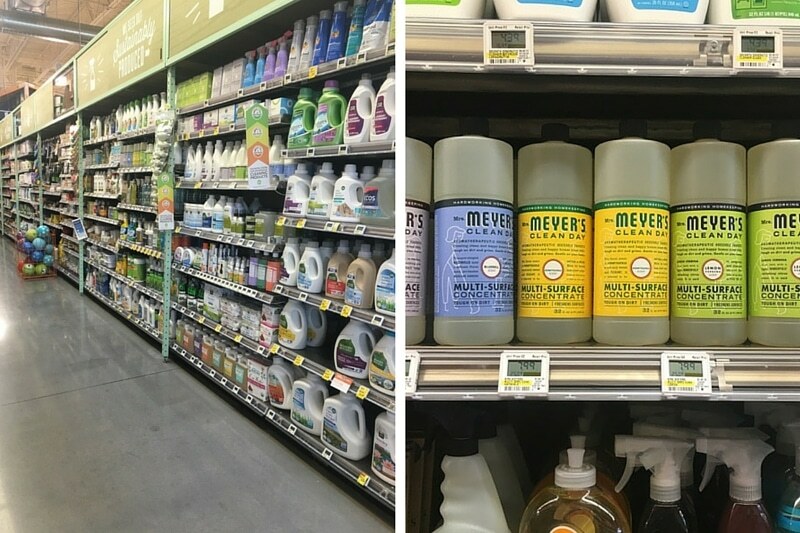 We love that all of the Mrs. Meyer’s Clean Day® products are full of plant-derived ingredients and essential oils, so they’re free from a lot of the typical cleaning chemicals like artificial colors, ammonia, chlorine bleach, and phosphates – and they smell amazing, too. 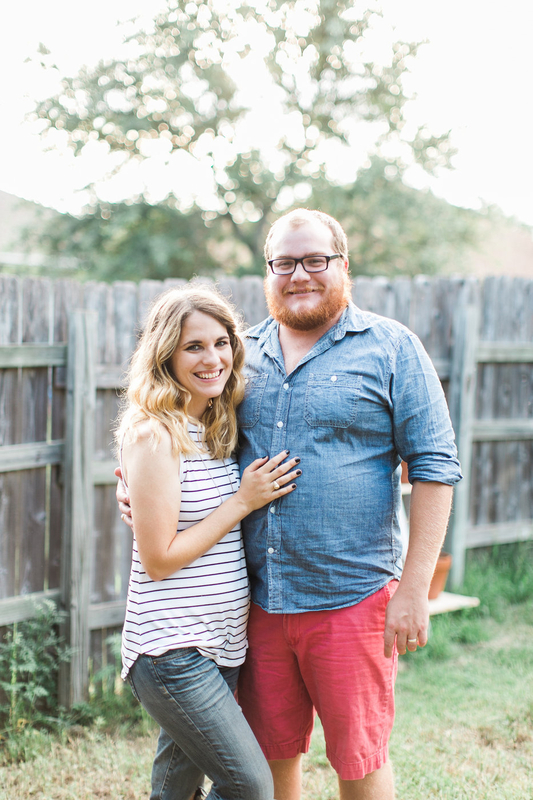 Oh, and as an added bonus, Mrs. Meyer’s Clean Day® is all about promoting creativity and encouraging people to “just keep making” – they’ve got an incredibly inspirational blog and tons of fun DIY projects on their website. That’s my kind of brand. I use theMrs. 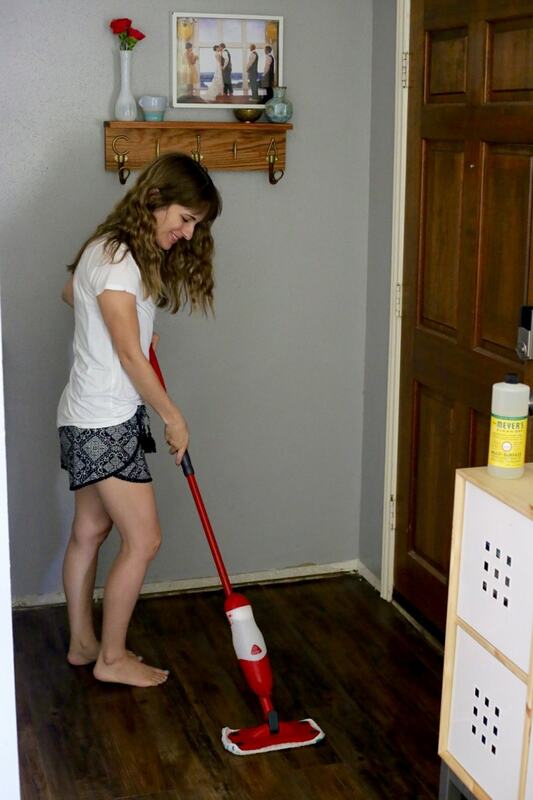 Meyer’s Clean Day® Multi-Surface Concentrate in the Honeysuckle scent, (though I’m newly obsessed with the Basil scent) for just about everything – my favorite use is to put a couple of capfuls in our spray mop so the floors smell nice and clean after I’m done mopping. Something about that amazing scent makes me happy enough with the end result to actually enjoy mopping. Seriously. It’s magical. 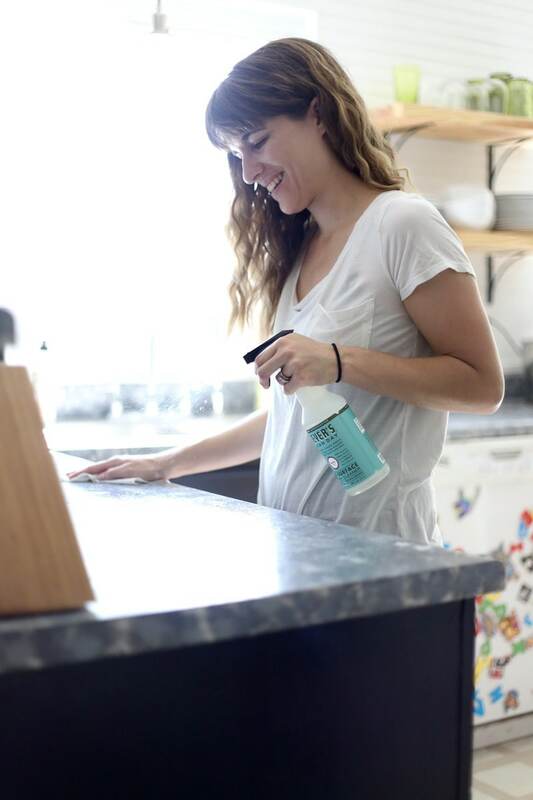 I also love using Mrs. Meyer’s Clean Day® Multi-Surface Spray to clean off our countertops in the kitchen. It’s gentle enough that it doesn’t mess with the surface at all (since they were a DIY project, I’m always pretty careful with them), and it gets them sparkling clean. I promise I’m not exaggerating when I tell you that I use Mrs. Meyer’s Clean Day® products to clean everything in my home. 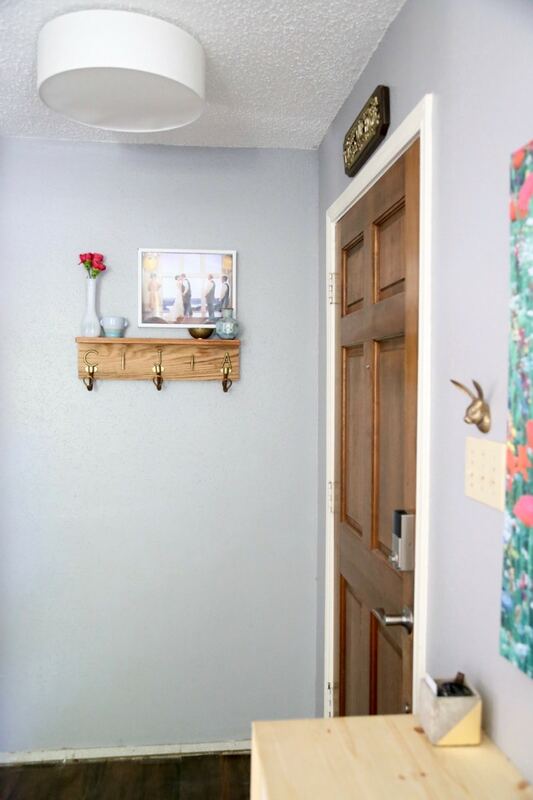 I’m so pumped about this little update to our entryway, and it makes me even more motivated to tackle the rest of the plans I have for this area (like painting the back of the door, updating the credenza, and finally installing baseboards). And thankfully, now I’m totally stocked up on Mrs. Meyer’s Clean Day® products so I can keep our house completely clean and organized this school year. Goodness knows when we come home from a long day at school the best thing I can walk through the door to is a house that’s filled with that Basil scent! What’s your favorite Mrs. Meyer’s Clean Day® scent? 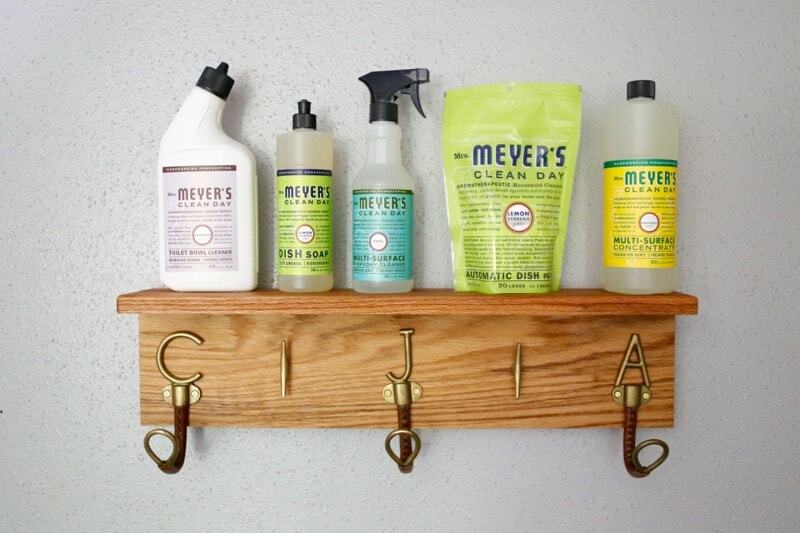 Have you checked out all of the awesome DIY projects on the Mrs. Meyer’s Clean Day® website? If you want to learn more about the Whole Kids Foundation and how Mrs. Meyer’s Clean Day® and Whole Foods Market are working together to support educating children about gardening and fresh produce, you can visit their website here, or see their promotional video here! You can also follow Mrs. Meyer’s Clean Day® on Facebook, Twitter, Pinterest, Instagram and YouTube for more awesome inspiration! Really like your entry way update. Don’t mean to be critical but I would paint or change the light switch. It may just be me but I have to change my light switches when I redo a room. Hey Debbie – I absolutely agree with you. This room is still far from done (there aren’t any baseboards in the room either, haha) and that’s definitely on the to-do list! Where did you get the bunny head hook? I love your idea. Our neighbor has a shelf about like what you made. My house is almost 100 yrs. old. The front has a covered porch which my husband treats like a “storage area”. I’m working on clearing it. When you come into the front door there is a small room about 10′ by 10′ to your left where my husband has his “office”. It would make a nice foyer. It was an office space when we looked at the home. I had my piano sitting against the stair railing, but it collected clutter and was damaged when a ladder feel on it. I moved it into the living room which is to the right. The living room is separated by two low “half” walls which held pillars. The owner before took them down. They are in the basement, but the were sawed off at an angle. I’d loved to put them back up, but they cracked when our basement flooded and they over turned into the water. The spilts aren’t bad. Now, to my idea, As you enter though the front door to your right is a corner that’s 33″ by 31″. I’m thinging of putting a corner shelf and using old door knobs as hooks. 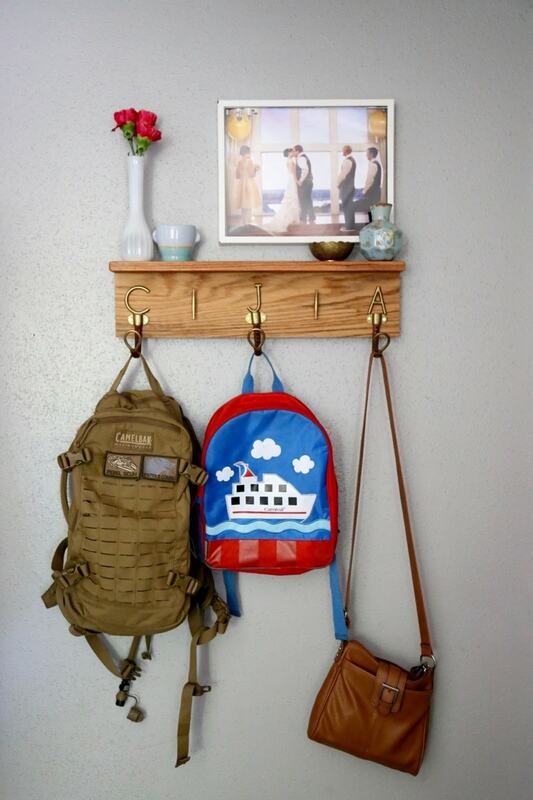 I could also upcycle one of the pillars into a coat rack, but I think that it will look too “haevy” in the corner. I plan on making a bench using two chairs and setting them across the door next to the stair railing. People then can sit down and remove the shoes. I have a table which is made from the bottom of a threadle wheel sewing machine. The treadle could be used to place shoes. I have a lot of ideas. Also, I’m decluttering moving towards minimalist. My husband wants me to declutter my unused items, but he doesn’t participate. I’m physically handicapped from an incurable disease called Stiff Person Syndrome, so if I stay here I have to make it easier to keep up with the household. Sounds like you have some awesome ideas for your home, Beverly! 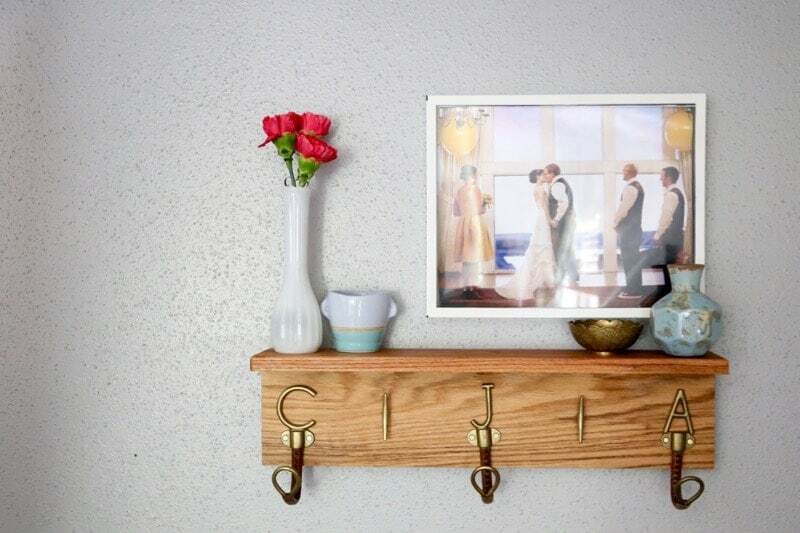 I like how quick and easy projects make you fall in love with your house again. Your entryway updated turned out so nice. Your entry looks great! 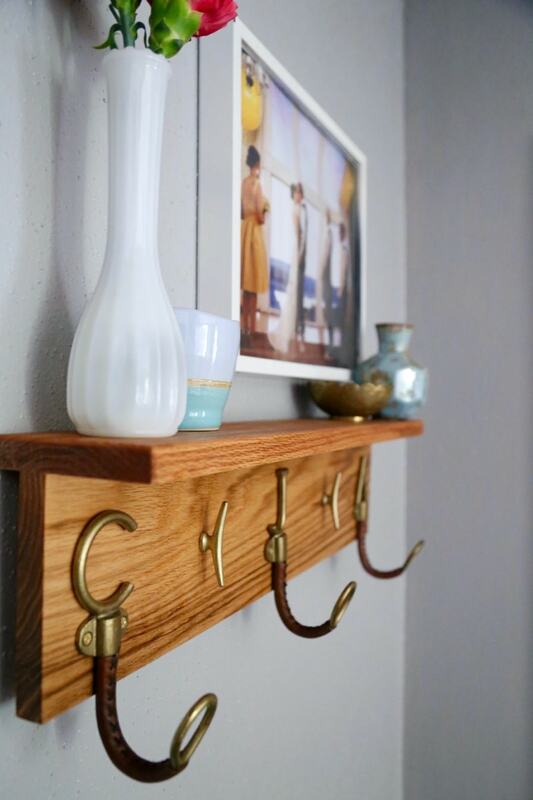 I love the new shelf and especially those initial hooks – so cute! That is great coat rack, I am waiting you to tell me after one year what is situation with hooks, are they in same condition like first year. Two years ago I bought modern looking sanded hooks but now they are all frayed. I am freaking out now every time I see them, when I come home and when I am going out. I must change them but I don’t want to make same mistake again. i’ve never seen hooks with initials. super cute.